United States (US) President Barack Obama will visit the Philippines next month, the White House said in a statement released early Saturday morning (Manila time). The administration of President Benigno Aquino III, through spokesperson Edwin Lacierda, confirmed Obama’s visit from October 11 to 12. The discussion about security issues is unsurprising given that it is US Defense Secretary Chuck Hagel who first hinted during a visit last month that Obama will come to the Philippines before attending the APEC event. The Obama administration noted that the Philippines is already the fifth Asian treaty ally that he has visited during his term. The announcement of the visit was hailed by Philippine Ambassador to US Jose Cuisia. “The visit underscores the importance President Obama places on the enduring alliance between the United States and the Philippines as well as his regard for President Aquino’s leadership,” he said in a press release. “We are optimistic that in their discussions, President Aquino and President Obama will identify new opportunities for mutually beneficial cooperation in the areas of defense and security, trade and investment and broader people to people ties,” the ambassador further noted. This is Obama’s first visit to the Philippines. The last United States president to set foot in the Philippines is George W. Bush. 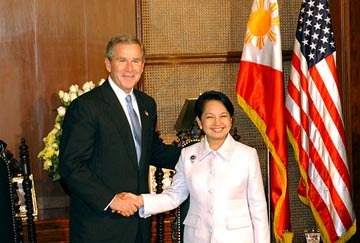 He came to the country in October 2003, during the time of then-president Gloria Macapagal-Arroyo.